Invasive species are taking over natural landscapes. While chemical control methods have been used in the past, biological controls, such as the use of goats to manage invasive species, are gaining public interest. 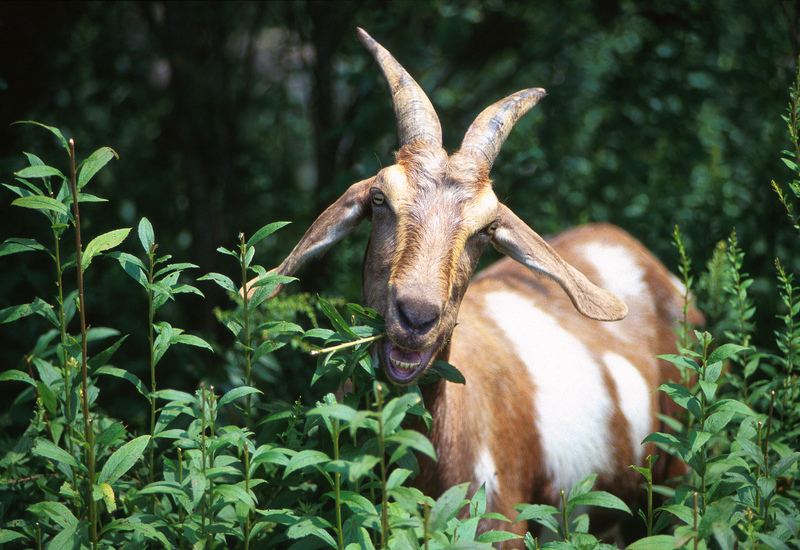 Are goats the best answer to the growing problem of invasive plants? Figure 1. 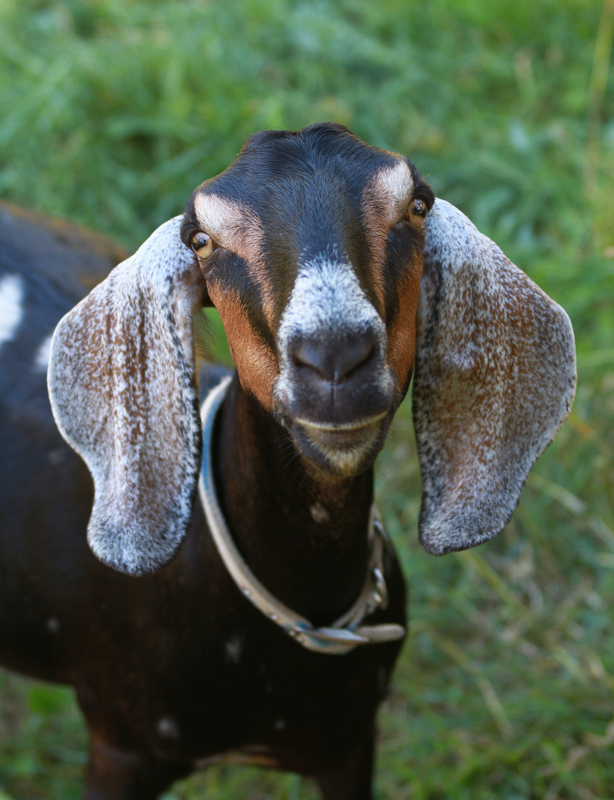 This female goat may be used to control invasive plant species. Courtesy of Lisafern, 2010, WikimediaCommons. Public Domain. While much research has been devoted to documenting invasive species and experimental methods of control, much less research has focused on effective control methods that can be applied by landscape and natural resource managers on a large scale. 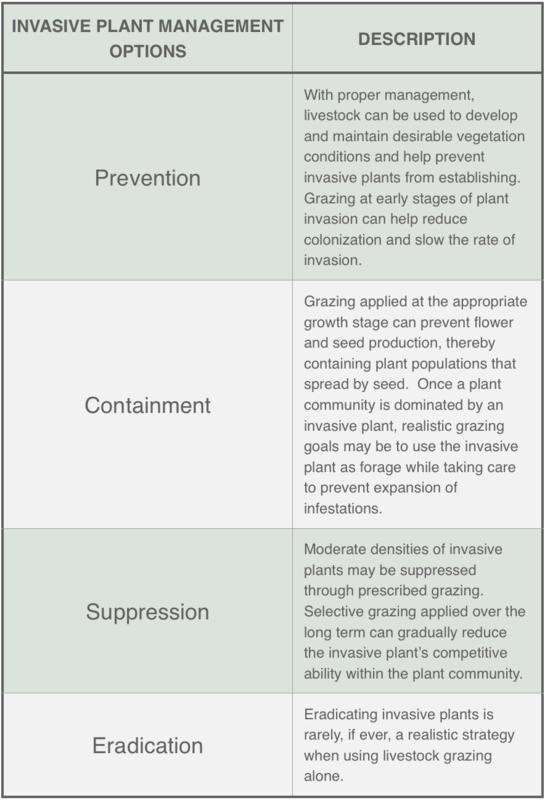 Control methods for invasive plant species are a huge contributor to the overall cost of the invasive species problem and can include: chemical by use of herbicides, mechanical through mowing or burning, or biological by introduction of a species that preys upon the invasive species in some way.7 One method of biological control that has received increasing public interest is the use of targeted goat grazing. The use of goats to control invasive plants may be a win-win situation, whereby society gets the benefit of reduced damage from invasive plant species, and farmers profit from a plentiful and free source of food for livestock. However, there are still many questions regarding when and where goats are an effective control method, and if providing goat grazing services is a viable business model for farmers. Figure 2. Invasive Plant Management Options. Data obtained from the U.S. Fish and Wildlife Service, 2009. Public Domain. Figure 4. Goats graze on both woody and weedy species. They typically consume the younger and more tender parts of the plant first. Photograph of Scott Bauer, USDA, 2013, FlickrCommons. CC BY 2.0. Academic research on goat grazing to control non-native invasive plant species has focused mostly on the response of individual plant species to goat grazing treatments and the grazing tendencies of the goats. While this information is useful to the study of invasive species control, there has been little attention paid to the economic and managerial feasibility of these specific goat grazing methods. Silliman et al. (2014) propose goat grazing as a management tool with possible economic benefits for farmers and land managers, but this remains unproven in the United States.9 In some European countries, government payments to farmers for the services of invasive species control has created a sustainable model that benefits landowners, resource managers, the general public, and the environment.9 Such a system for invasive species control through livestock grazing has yet to materialize in the United States. Future research into grazing-based solutions to the invasive species problem should address the scientific, social, and economic factors that contribute to management plans so that long-term sustainable and scalable solutions can be developed. Goehring et al. (2010). Late-Season Targeted Grazing of Yellow Starthistle (Centaurea solstitialis) with Goats in Idaho. Invasive Plant Science and Management, 3(2):148-154. Hellman et al. (2008). Five potential consequences of climate change for invasive species. Conservation Biology, 22(3):534-543. Ingham, C.S. (2014). Himalaya Blackberry (Rubus armeniacus) Response to Goat Browsing and Mowing. Invasive Plant Science and Management, 7(3):532-539. Ingham C.S. & Borman M.M. (2010). English Ivy (Hedera spp., Araliaceae) Response to Goat Browsing. Invasive Plant Science and Management. 3(2):178-181. Kettenring, K.M. & Adams C.R. (2011). Lessons learned from invasive plant control experiments: a systematic review and meta-analysis. Journal of Applied Ecology. 48(4):970-979. Pimentel et al. (2005). Update on the environmental and economic costs associated with alien-invasive species in the United States. Ecological Economics. 52(3):273-288. Davison, Karl. (2017). [Photograph of English Ivy]. Retrieved from FlickrCommons. CC BY-NC-SA 2.0. Endico, Dawn. (2005). [Photograph of Himalayan Blackberry]. Retrieved from FlickrCommons. CC BY-SA 2.0. Lavin, Matt. (2015). [Photograph of Yellow Starthistle]. Retrieved from FlickrCommons. CC BY-SA 2.0. Lisafern. (2010). [Photograph of female goat on a farm]. Retrieved from Wikimedia Commons. Public Domain. NY State IPM Program at Cornell University. [Photograph of Spotted Knapweed]. Retrieved from FlickrCommons. CC BY 2.0.
stux. (2013). [Photograph of Phragmites]. Retrieved from Pixabay. Public Domain. U.S. Department of Agriculture. (2013). [Photograph of grazing goat]. Retrieved from FlickrCommons. CC BY 2.0.